Princesses and Books and Monsters? Oh, My! Today, an unexpected thing has happened. For the first time in weeks I have a couple of clear hours in which to get some writing done. I’m going to get right on that. There is a novel to finish, and then rewrite from the ground up. But because it’s a shock to be suddenly presented with writing time, I had to settle my nerves by doing a little procrastinating first. So I decided to make a word cloud for No Bears. I thought it would be amusing. I thought I would simply get one giant word – BEARS – blocking out everything else. Huh. Turns out that book really isn’t about bears after all. I guess sometimes the writer is the last to know. 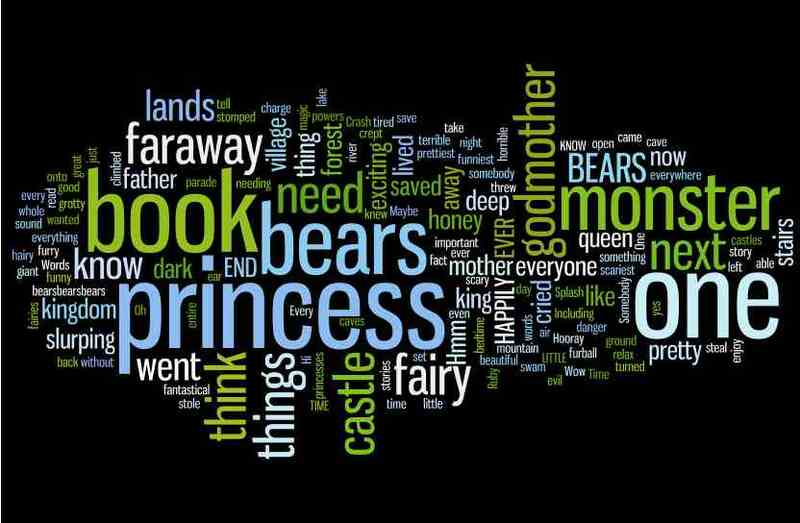 I do like word clouds. They’re fun. But also kind of pointless. Which is why I have allowed myself just one. And now I am off, to get.this.elusive.novel.done. This entry was posted in No Bears and tagged not-writing, writing on October 19, 2012 by Meg McKinlay. Congratulations ,Meg, for finally having some free time to get some writing done. I agree with you that we all tend to procrastinate a little! I liked your word cloud and sounds like a very interesting book. Can't wait to read your book. Hope you have more time to finish the book soon. Cheers, Jeff, and all the best for your own work.